Poipu Kai is a planned 70-acre community in Poipu. 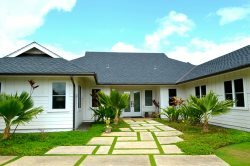 There are two housing areas: Bayview and Lanai Villas, and several condominium complexes: Poipu Sands, Regency (Phase I and II), Regency Villas, the Villas at Poipu Kai, Manualoha, and Kahala. Poipu Kai not only has a beautiful pool and hot tub, gorgeous grounds and gardens, with coconut and plumeria trees, bougainvillea, bird of paradise and red and pink ginger, just to name a few, there are benches along the way to sit and relax and watch the world go by. The Community has a pathway called “the greenbelt” that goes between Brennecke’s Beach at one end and Shipwreck’s Beach on the other. It’s a perfect place to walk, whether to view the sunrise at Shipwreck’s fronting the Grand Hyatt Kauai or to enjoy the sunset at Poipu Beach Park. You can walk to several restaurants, too. The Hyatt has Tidepools, Ilima Terrace, Stevenson’s and Dondero’s. Brennecke’s Restaurant is opposite Poipu Beach Park and Kalapaki Joe’s is over by the community pool. There is also a large tennis facility next to the pool. Beyond Shipwreck’s Beach, you can leave Poipu Kai and enter a very different environment with ironwood trees and craggy cliffs and walk as far as you want on the Mahaulepu Coastal Trail.